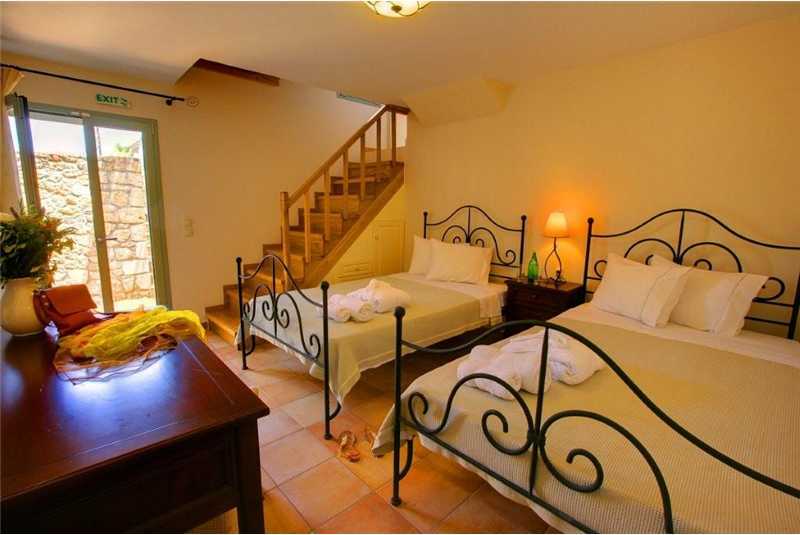 Villa Thea is a two bedroom villa overlooking both the Bay of Assos and its famous Venetian fortress, an idyllic location only a short stroll from the waterside tavernas, cafes, bars and pebble beach of the picturesque Venetian style village of Assos. 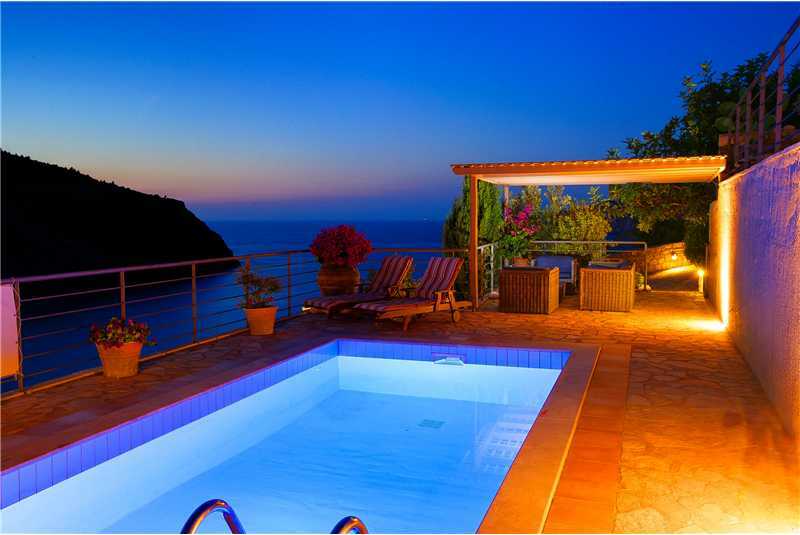 Villa Thea is set on a small hillside on the outskirts of the pretty fishing village of Assos. 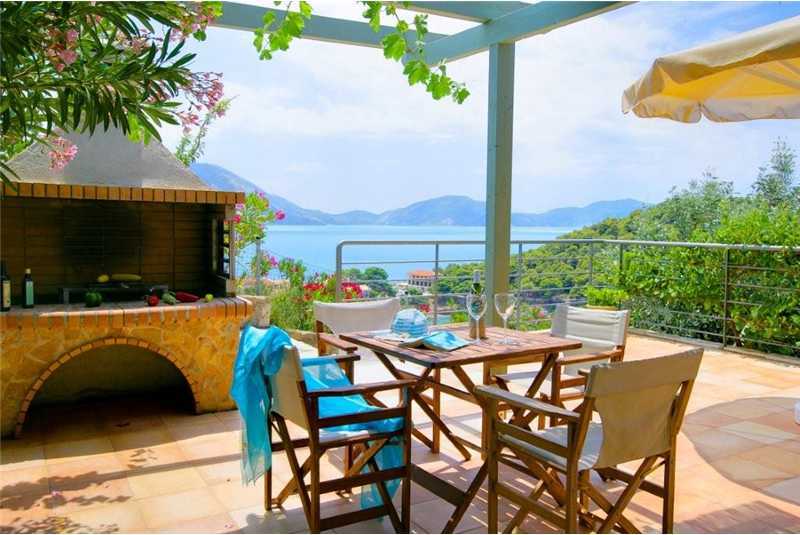 Located just 90 metres from the sea and only a short stroll from the peaceful village of Assos where Venetian style homes overlook the crystal clear waters of the harbour. In the evenings the harbour lights create a magical setting for you to enjoy a nice romantic meal at one of the waterside tavernas that overlook the yachts moored in the harbour. Across the bay, towering above the village is the magnificent Venetian Fortress of Assos, whose ruins and walls stretch for over two kilometres and are worth spending half a day exploring. The water around the pebble beach in the harbour is crystal clear with excellent snorkelling exploring the many caves and rocky outcrops. 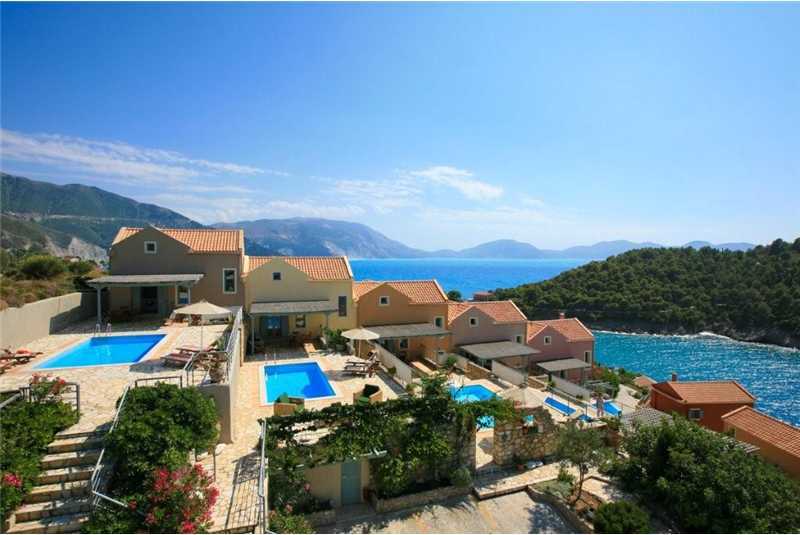 Villa Thea is ideally located to explore the entire island by day with most of Kefalonia’s tourist attractions within an hour’s drive. 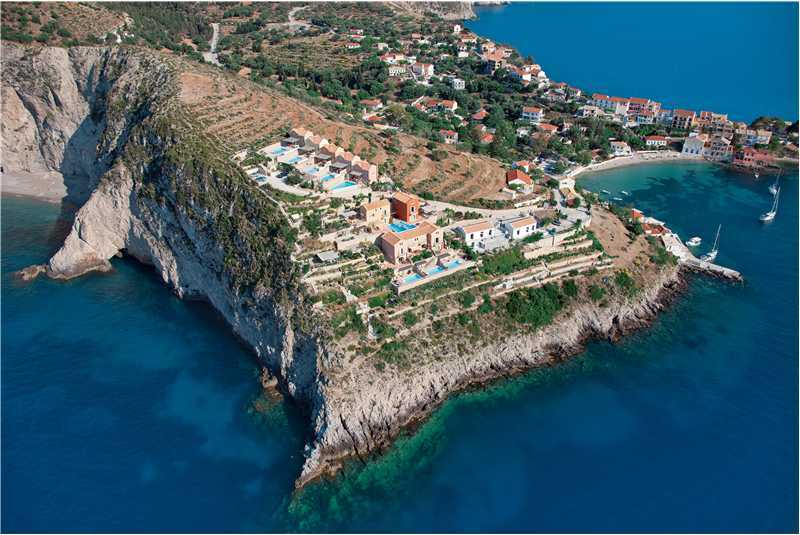 The most famous beach on Kefalonia, Myrtos with its turquoise water and fine golden sand, is only a ten minute drive from Assos. Heading north from Assos are the picturesque pebble coves of the Erisso peninsula with the famous bustling harbour village of Fiscardo, only twenty kilometres drive away. 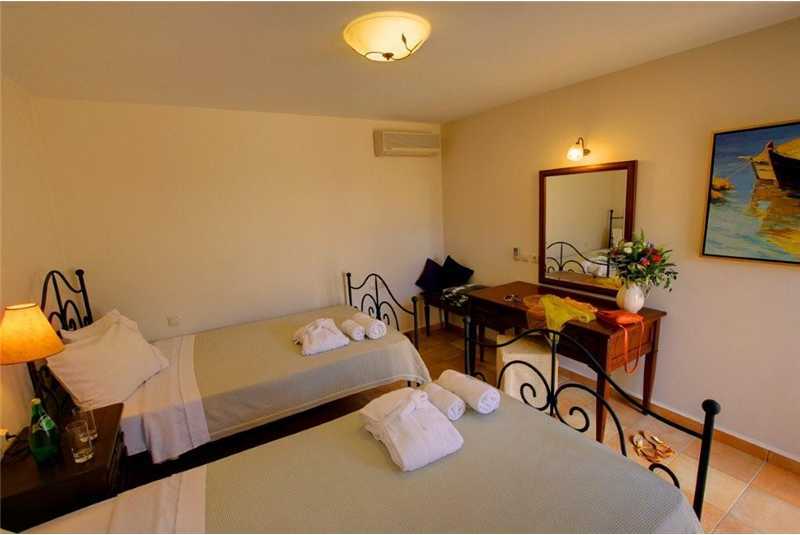 In Fiscardo you can hire motor boats or yachts for one or more days, to explore the coastline of Kefalonia or visit the beautiful islands of Ithica or Lefkada. The hardest choice you will have is not choosing where to visit, but whether or not you can drag yourself away from picturesque sleepy village of Assos. 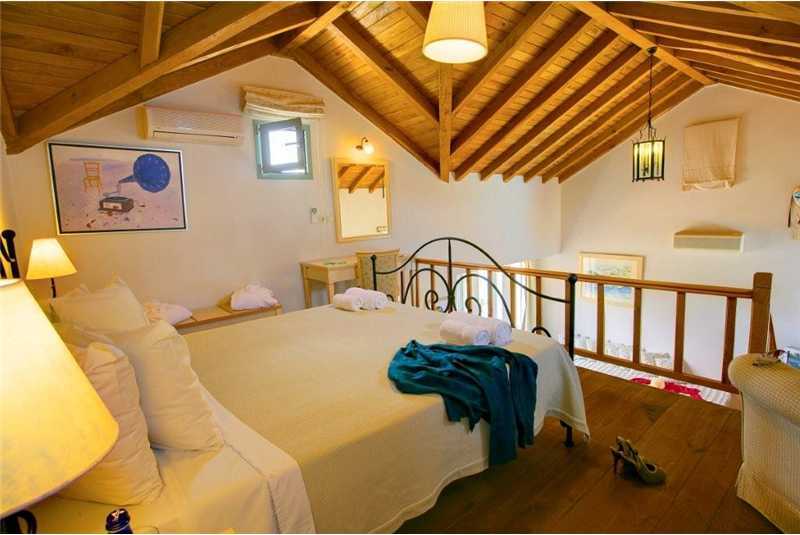 Villa Thea is a fully air conditioned two bedroom terraced villa, tastefully furnished with a mixture of modern and traditional furniture. The main entrance leads directly into a modern white fully equipped kitchen with access out onto a beautiful swimming pool terrace. A family shower room with wc is located next to the kitchen by the front door. 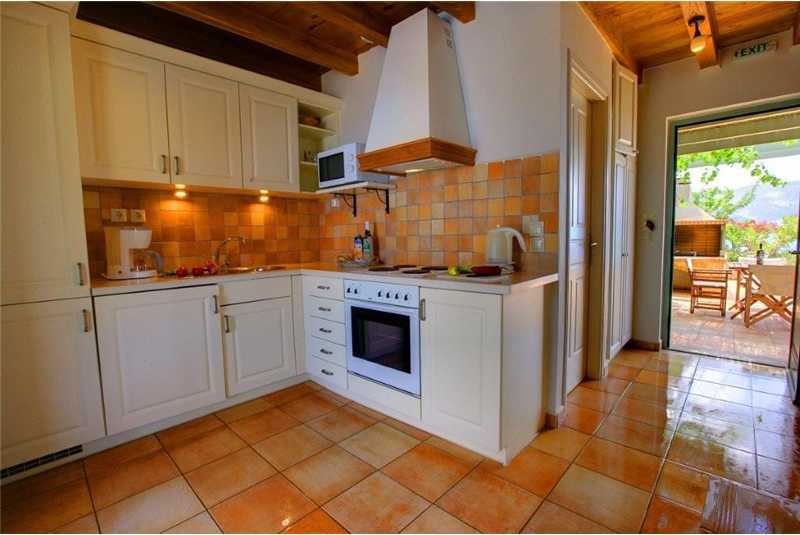 A few steps lead up from the kitchen into a spacious open plan dining room and living room area with a high vaulted wooden ceiling and windows that overlook the Bay of Assos. 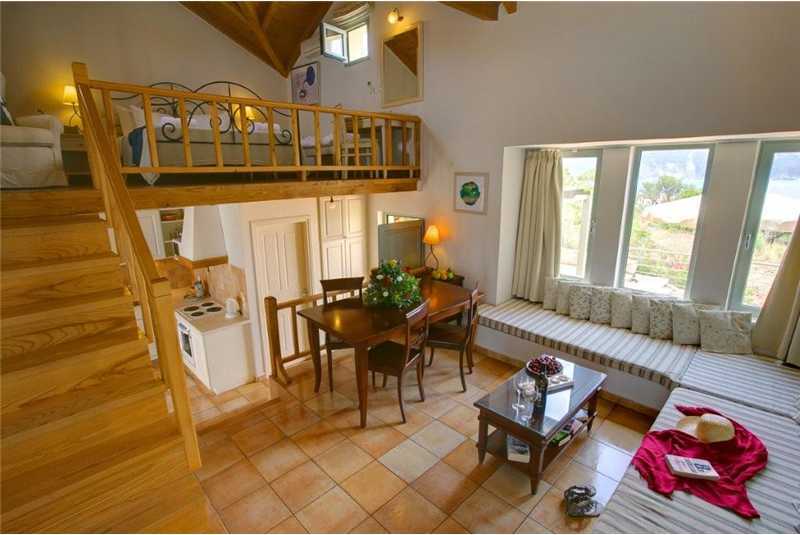 A further set of wooden stairs lead up from the lounge to the master double bedroom, set on a romantic gallery with a wooden floors and a vaulted ceiling that overlooks the lounge below. 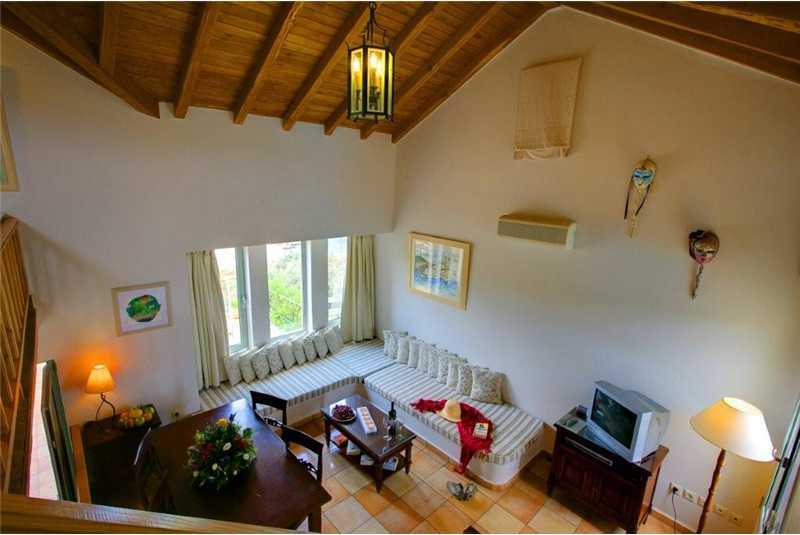 On the ground floor there is a twin bedroom with double doors that open out onto a small terrace which has access to the spectacular swimming pool area above. 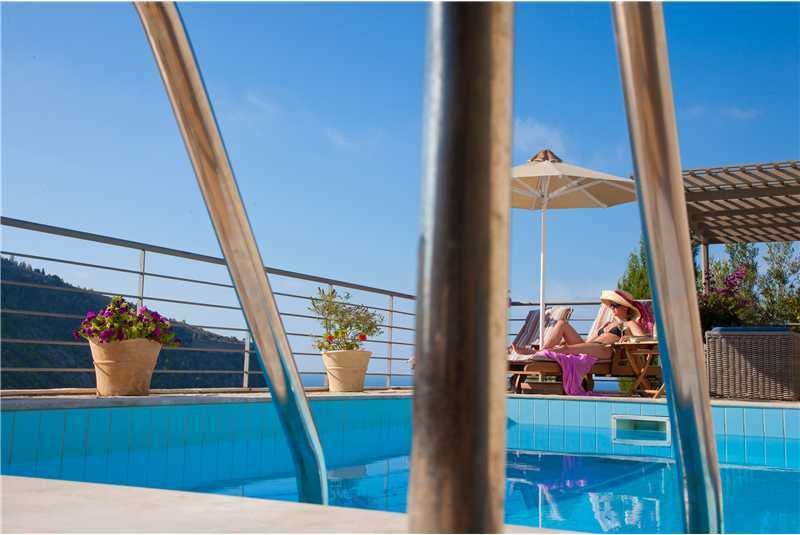 Next to the swimming pool is a large pergola furnished with two wicker armchairs and a sofa with stunning sea views, a great place to relax during the day reading a good novel, or in the evenings enjoying a glass of local wine whilst watching the sunset over the Ionian Sea. 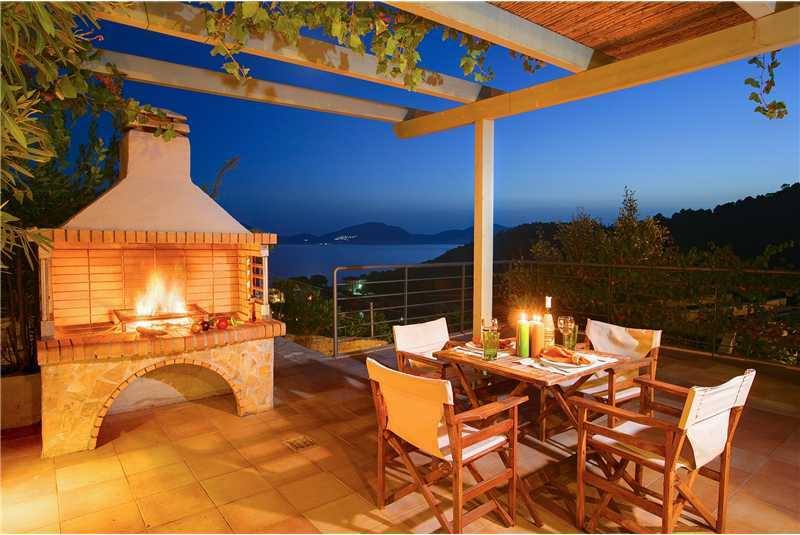 At the front on the villa is a spacious terrace with built in barbecue and an al fresco dining area with wonderful views over the Bay of Assos towards Myrtos beach. At the end of the garden there are parking spaces and steep steps that lead down to the seafront, to a small rock swimming platform, from here you can swim 200 metres to a platform beach, which otherwise is only accessible by boat. 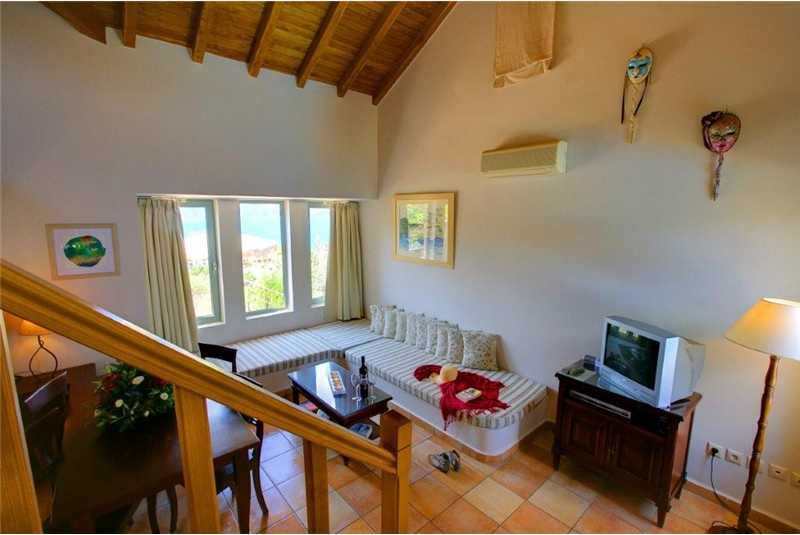 Open plan dining area and lounge with local satellite TV,DVD player, cd player and Ipod docking station. 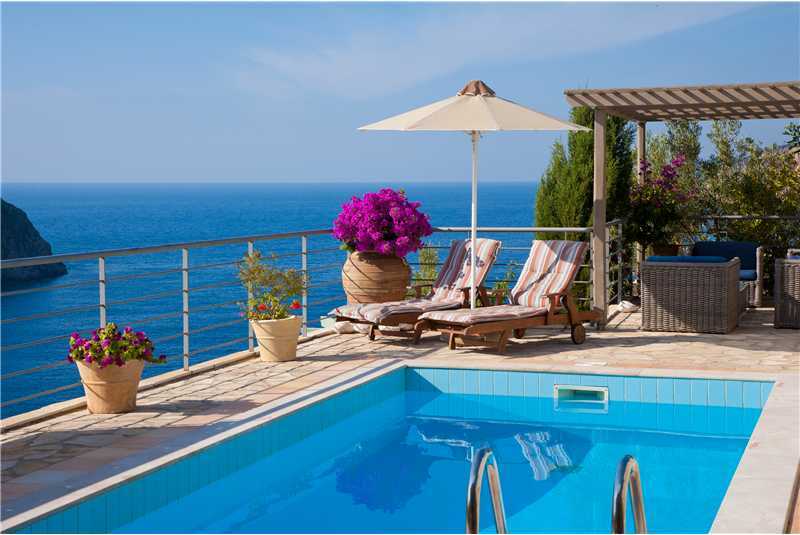 Infinity swimming pool with wooden pergola with wicker garden furniture. Steps leading to private beach.